Go to the production Registry (or to the Sandbox if you want to try things out first). Please note that separate signons are necessary for each, and do make sure you know whether you're in Production or Sandbox before you start! Click on sign in/register in the top right hand corner. When the sign in/register form appears, if you haven't yet registered click on the checkbox next to "click here to create a new account" to display the rest of the registration form and register yourself as a user. If you just want to browse the Registry, you don't need to register, but user registration and login is essential for managing schemas and vocabularies. As a registered user, you may now register an organization or a person as a Resource Owner or maintenance agency. When you register an owner, you automatically become an administrator for that owner/maintenance agency within the Registry. All registered vocabularies must have an owner, but registered owners may have any number of vocabularies. Not every vocabulary owned by a particular agency or individual will be managed by the same maintainers. Required information for owners or maintenance agencies allows essential contact to be maintained between the individual or organization and the Registry. Contact information is used to provide notifications of activity and to provide assistance in the event of problems, and is not shared with other organizations or displayed to the public. As an administrator for an owner/maintenance agency you can add other registered users as maintainers for the vocabularies you register. Click on the tab for "Members." There you will see one member: the administrator that registered the entity in the first place. Below the second blue bar, at the right side, you will see a button to "Add member. When you click on that button, you will be given a list of all registered users from which to select (a new maintainer must already be registered as a user in order to be able to be assigned as a maintainer). Select a new maintainer from the list and "save" or "save and add." After you've registered an owner/maintenance agency (and perhaps a maintainer or two), you will be shown your accepted data. On the right side menu, you will see a selection of browse categories that will allow you to either browse already registered owners, vocabularies or schemas, or register a new owner, a new vocabulary or a new schema. If you click the (add) vocabulary or (add) schema link, you will be presented with a form to fill out for your vocabulary or schema. You MUST be an administrator or a maintainer associated with the owner to register a vocabulary or schema for that owner. IMPORTANT: If you are a maintainer or administrator for more than one owner, you will be given a pull down list to select on behalf of which owner you are registering the vocabulary. It is critical that you select the correct owner at this stage, because all other relationships cascade from this action. Name (required): Use the full name by which the vocabulary is commonly known. URL: If the vocabulary is available from or has additional documentation on a website, key in the full address here, including the "http://" portion. NOTE: This URL is not the one that will be used to create the Vocabulary's URI--that comes later. Note: Any relevant human-readable text may be added here. Remember that this will be publicly available to those browsing the Registry. Community: If the vocabulary was developed for use by a specific community, it may be noted here. Base Domain: If no specific domain is entered here, the form will default to the Registry domain: http://metadataregistry.org/uri/. You may override the default if you wish to use a specific domain associated with the vocabulary owner. If you use a specific domain, you should contact the Registry staff about a script that will properly direct browsers and applications to the registry via your site. Token: The token distinguishing the specific vocabulary (ensuring unambiguous URIs) should be related to the vocabulary name, but in shortened form. URI: If you click in the URI box the application will ask you if you wish to associate the domain name and token to create the base URI for the vocabulary. You should say "yes." IMPORTANT: If you are a maintainer or administrator for more than one owner, you will be given a pull down list to select on behalf of which owner you are registering the schema. It is critical that you select the correct owner at this stage, because all other relationships cascade from this action. Label (required): Use the full name by which the vocabulary or schema is commonly known. This will be used in the list of schemas for browsing. Name: The name distinguishes the specific schema (ensuring unambiguous URIs) and should be related to the schema label, but in shortened form. Namespace URI: If you click in the URI box the application will ask you if you wish to associate the domain name and token to create the base URI for the vocabulary. You should say "yes." URL: If the schema is available from or has additional documentation on a website, key in the full address here, including the "http://" portion. NOTE: This URL is not the one that will be used to create the schema's URI--that comes later. Tags: If the schema was developed for use by a specific community, it may be noted here. Status: A pull-down list identifies the statuses that are valid here. If the status chosen is other than "Published," this implies that a formal or informal schema development process is in place. Language: This is where the default human-readable language for the schema properties should be specified. 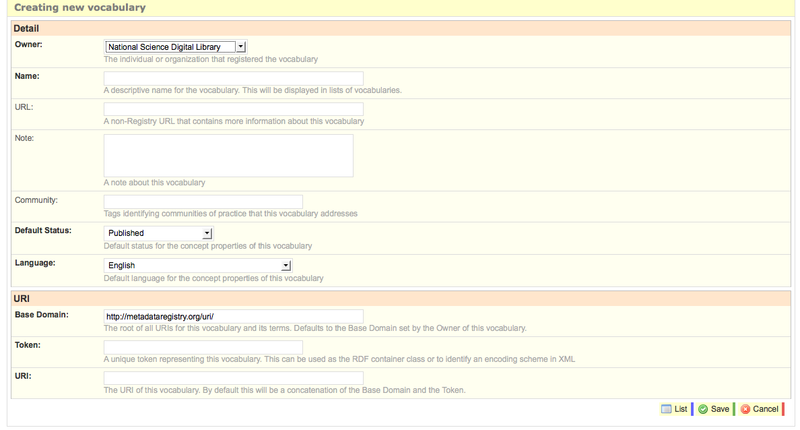 Once your vocabulary is registered, you may add concepts/terms by clicking on the concepts tab at the top. You will be presented with a header with the name of your vocabulary, and an "Add Concept" button at the bottom. After the first concept is entered, you can use "save and add" to save the current concept and invoke an empty form to register the next in the same step. We suggest that you register all your concepts FIRST, before adding any properties to the concepts (why we suggest this will become more obvious when you begin to create relationships between concepts). Preferred Label: This is the required human-readable label for the concept/term. For multi-word labels, use normal spacing and capitalization. URI: When the form is presented, the URI will default to the Domain name/token you chose for the vocabulary, and a unique number. If you prefer a different number or a text string, you can substitute it for that defaulted number before saving the entry. Once the page is saved, the URI cannot be changed, but instead must be deprecated and the concept re-entered. Top Concept? : If your vocabulary contains a hierarchy, the top concepts (for which there is no broader term) should have this box checked. Status: Normally, the registering organization will specify how status will be used in the context of the development of the vocabulary. There is no default development process, but when notifications are available changes in status may trigger notifications. Language: On this form, language is defaulted from the top-level vocabulary registration. Language is also a specific property for each specific property of the concepts (and can be edited there), so currently the listed display of multi-lingual vocabularies may be incorrect for specific properties. As multiple language capability is made available for vocabularies, this default will be eliminated. You will only be enabled to add terms or edit terms for vocabularies for which you are an administrator or maintainer. All administrators and maintainers are listed at the bottom of the top-level vocabulary page. Once your schema is registered, you may add schema properties or classes by clicking on the "Properties" tab at the top. You will be presented with a header with the name of your schema, and an "Add Property/Class" button at the bottom. After the first schema property or class is registered, you can use "save and add" to save the current one and invoke an empty form to register the next in the same step. We suggest that you register all your schema properties or classes FIRST, before adding any specific properties or relationships (why we suggest this will become more obvious when you begin to create relationships between schema properties and classes). Label: Enter the information that will be used to display the name of the property to a human user. Labels may be multiple words, and should have the appropriate spaces to allow humans to understand them easily. Name: This is the portion intended to be interpreted by machines. It should be camel-cased, with no spaces. URI: When the form is presented, the URI will be blank. When you fill in the "Name" of the property, and tab to or click on URI, the system will default to the Domain name/token you chose for the schema, with the name appended. If you prefer a different URI--for instance a number rather than a text string--you can override the defaulted name before saving the entry. Once the page is saved, the URI cannot be changed, but instead must be deprecated and the concept re-entered. Description: Normally a definition of the property or class is entered as the description. Comment: Clarification of the definition or examples of appropriate values may be added here. Type: Either property or class must be chosen. Status: Normally, the registering organization will specify how status will be used in the context of the development of the schema. There is no default development process, but when notifications are available changes in status may trigger notifications. Language: Enter the default language for all elements of the property. The system will default to the language of the vocabulary itself, but this can be overridden for multilingual schemas. NOTE: You will only be enabled to add terms or edit schemas which you are an administrator or maintainer. 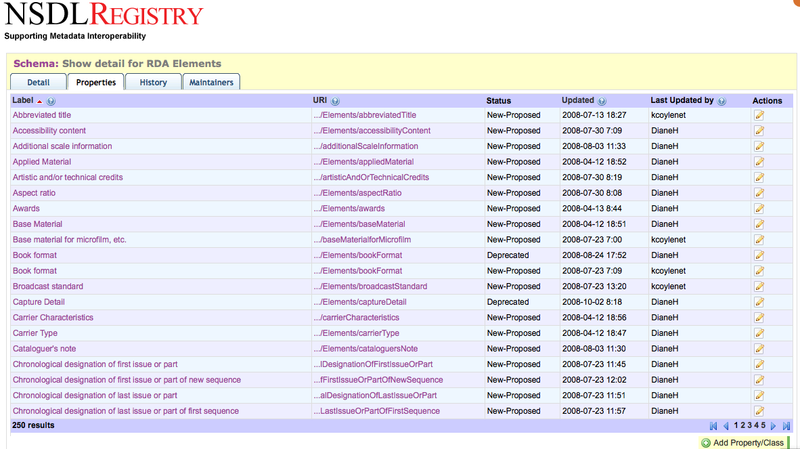 All administrators and maintainers are listed at the bottom of the top-level schema page. Once your concepts/terms are registered, you can add additional properties to them. To add properties, invoke the list of your concepts, then click the link on the one to which you wish to add properties. When the concept displays, click on "Properties" on the top tab, and then the "Add Properties" button on the bottom. The Registry will present a form to be filled out for the new property. Value: Add the text information appropriate to the property chosen. When you add "broader," "narrower," or "related" properties to a concept, the Registry will automatically present you with a list of other concepts available for the reciprocal relationship. The Registry will automatically add the reciprocal in the related concepts. If you delete any of those properties, the reciprocal property will also be deleted. 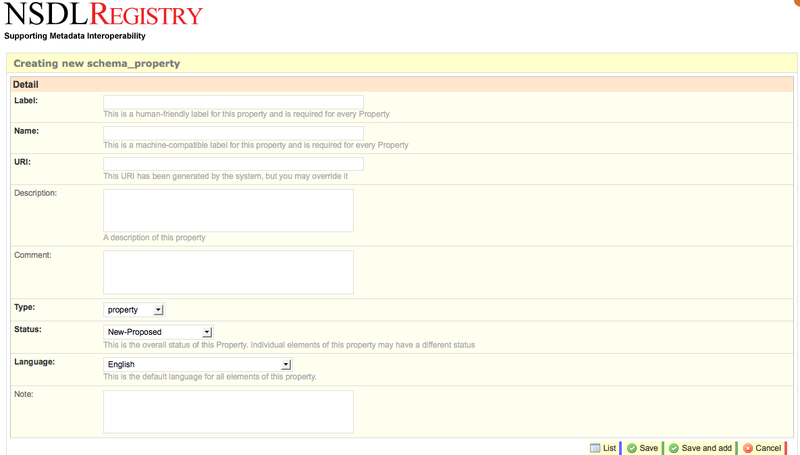 When the form is saved, the new properties will be listed at the bottom of the concept page. Remember, you will only be enabled to add or edit properties to vocabularies for which you are a registered administrator or maintainer. All administrators and maintainers are listed at the bottom of the top-level vocabulary page. 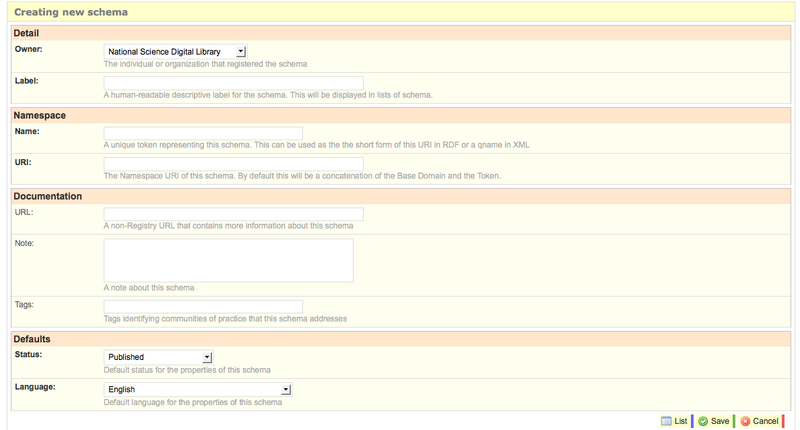 Once your schema properties are registered, you can add additional properties to them. To add specific properties, invoke the list of your schema properties, then click the link on the one to which you wish to add properties. When the concept displays, click on "Elements" on the top tab, and then the "Add Property/Class Element" button on the bottom. The Registry will present a form to be filled out for the new property element. Value: Add the text information appropriate to the property element chosen. When you add "isSubpropertyOf" or "hasSubproperty" to a schema property, the Registry will automatically present you with a list of other schema properties available for the reciprocal relationship. The Registry will automatically add the reciprocal in the related schema property. If you delete any of those specific properties, the reciprocal will also be deleted. Language: Add the appropriate language for the property from the pull down list. Status: Add the appropriate status for the property from the pull down list. This page was last modified on 31 October 2008, at 14:47.